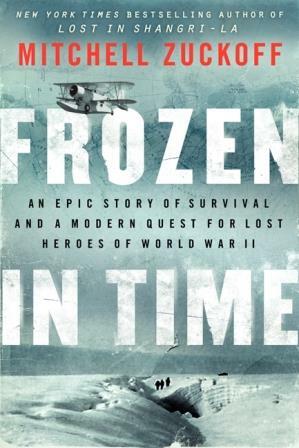 Airplane crashes and rescues are not my usual cup of tea, but after having read Mitchell Zuckoff's Lost in Shangri-La last year, I knew I could not pass up the opportunity to read and review his latest, Frozen in Time. Besides, I have a special place in my heart for the military. My grandfather was stationed in the South Pacific during World War II, and so never visited Greenland, as far as I know. I can't recall if my father had ever been there. Of course, he was born in January of 1943, and so had no knowledge of the events transpiring in Greenland at the time, about the search and rescue missions and the downed planes. This is the kind of book I would have gotten him as a Father's Day present though--I know he would have enjoyed it. I am always awed by stories of the selflessness of our soldiers, about our heroes. Ordinary men (and women) who do extraordinary things to help others. The men described in Frozen in Time faced great odds and yet they were willing to risk their lives to help their fellow man. Zuckoff's description of the conditions faced in Greenland during the winter of 1942/1943 were frightening to say the least. I can't even imagine. I often say that I like it when fiction authors are able to turn the setting into its own character--well, Greenland certainly earned that role in Zuckoff's nonfiction book. Greenland humbled the cockiest of men. It was in control and the island never let anyone forget it. The author goes back and forth in his book between the past and the present. I admit I was most taken with the past and couldn't wait to get back to the survivors on the icecap when reading the more modern sections. Just the same, it was interesting to read about the difficulties faced in trying to get the expedition to find the Grumman Duck as well as all that went into it. I was pulling for Lou Sapienza as he tried to get the money and support he needed to carry it off. I admired the dedication and willingness of U.S. Coast Guard Commander James Blow to bringing the bodies of the World War II Coast Guard Vets home. And I was eager to see the team they put together succeed. With the crash of the C-53 Cargo plane, the rescue effort began. It was an impossible search. No one knew where the plane had crashed and communication with the five crew aboard was limited. The odds were against them from the start. The nine men on the B-17 who had been sent on the rescue mission were ill-prepared for surviving in an arctic climate, which is exactly what they were forced to do when their plan crashed. It was a harrowing experience for them all. A couple of the men were injured and all were affected by the bitter cold. They pulled together and did the best they could, not sure it would be enough. Through interviews and documentation, Zuckoff presents their experiences with candor, thoughtfulness and respect. I felt like I got to know each of the men and I wanted so much for them all to survive. Unlike the cargo plane who lost radio contact soon after the crash, the B-17 crew were in a slightly better position in that regard. They were able to communicate their location in order for possible rescue. Regardless, it would be a risky rescue. Surrounded by hidden crevasses and trapped on an active glacier that hadn't completely settled, the odds weren't good. John Pritchard, Jr, and Benjamin Bottoms of the Grumman Duck made a bold move in attempting to rescue the B-17 crew. Pritchard landed the amphibious plane on the ice cap itself. It was a success! Two of the survivors were able to fly out with Pritchard and Bottoms, reaching safety. Hopes were high that they could do it again, however, they were still cautious. Weather conditions were unpredictable. The second attempt was met with a bad storm and Pritchard, Bottoms and the lone survivor they had on board disappeared. There are many heroes in this story, from the military personnel who dropped supplies to the survivors, the pilots who searched from the sky for the downed planes, the dogs and their sledders as well as those on the motor sleds, those who directed and those who were in the field. They would stop at nothing until they brought the last of the survivors home. Frozen in Time is a tragic story as well as one of bravery and heroism. Men did die, becoming Greenland's victims. But men also survived, making this a story of hope as well. I was touched by Zuckoff's own efforts to bring the men of the Grumman Duck home, how invested he was in their story and that of the survivors of the B-17. I am glad he was able to go on the expedition to Greenland in search of the Grumman Duck. It brings the story home even more. To learn more about Mitchell Zuckoff and his books, please visit the author's website. You can also learn more about the author by visiting his Facebook page, and Twitter account. I hope you will check out what others had to say about Frozen In Time on the TLC Book Tours route! Many thanks to the TLC Book Tours for the opportunity to be a part of this book tour. Copy of Frozen in Time provided by publisher in e-book form. This sounds amazing!!!! I love stories like this, ones that really happened. I'd also heard such wonderful things about his last book. I'm off to see what I can get from my library. Sandy - I enjoy the author's writing style, and it's such an interesting story. It's admirable how much of himself he put into the project. You can tell it was more than just material for a book to him. I'm just starting to find out about these events because of the reviews for this book, and it sounds scary. Though the book sounds fascinating. Definitely does seem one where the historical aspects would be better. The first-hand knowledge (of the now) must enhance it quite a bit, too. Charlie - It really is a fascinating story, one I hadn't heard of before reading the book. This is firmly on my wish list and I can't wait to get to it!! Especially now :) Thanks for the great review! Jennifer - I hope you do get a chance to read this one! Not a good flier at the best of times I think I'll be giving this one a miss. Still, sounds like an inspirational read, I'm glad you enjoyed it. Tracy - I doubt I will ever want to fly to Greenland after reading this one, but it truly is an amazing story. So tragic though. I'm in awe of people who live through things like this with humanity as well. This book sounds fantastic! Kathy - I am too. Stories like this renew my faith in humanity. There are stories like this all around us, even today. I just wish we heard more about them. I have this one to review, too - now I can't wait to start it! Carrie - I can't wait to hear what you think of it, Carrie. I rarely read nonfiction but this one sounds like something I would enjoy. Thanks for your excellent review! Think I'll download a sample right now before I forget. Linda - Mitchell Zuckoff's writing is very readable. If you do read it, I hope you enjoy it! This is the kind of nonfiction that I absolutely love! I own his other book that you mentioned, but haven't read it yet. It's high up on my list though. I think I'm going to have to pick this one up for my dad - he'll like it and then he'll pass it on to me to read! Lisa - I am thinking this would be a good Father's Day gift for my father-in-law. What a coincidence. I just read about this on another blog. And now this post! The book sounds fascinating but also pretty tragic. Thanks for a wonderful review. It makes me feel like grabbing a copy right away. Neer - It is a very tragic story, but I am glad that those who did survive made it out okay. I am glad I took a chance on it. Sounds like a great read! I've not read his books so I'll have to check them out. Great review, Wendy! Melody - Thanks, Melody. I really enjoy his writing. The author has a gift for sharing history with his readers. Thanks for being a part of the tour for this fantastic book Wendy. I'm so sorry to hear about Riley. I know how that feels, unfortunately. Sending hugs your way. Thank you for your condolences, Heather. Riley meant the world to me and he is greatly missed. Samantha - It really was interesting. I hope you will check it out if you get the chance. Stacy - I don't read books like this often, but I've come to realize I do like them now and then! Cat Thursday: Let Me Have Some!